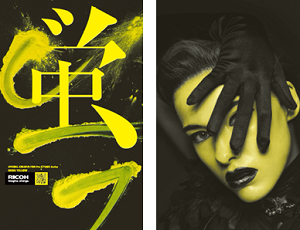 Ricoh has launched a Neon Yellow toner in Europe, allowing print service providers to produce highly creative, eye-catching value-added print. The Neon Yellow toner has been developed for the fifth colour station on the Ricoh Pro C7100X series colour cut sheet digital production press. It will meet growing demand from the magazine, direct mail, retail and point of purchase markets for print that differentiates. It expands the colour gamut, enhances images and can be used as a solid, highlight or graphic colour. When combined with other process shades, it can create a neon palette. The toner is reflective under UV light to extend the range of printing possibilities offered by standard CMYK, white, or clear printing. This extends the variety of print possibilities. Print service providers can then develop more visually inspiring campaigns with their clients and deepen consumer engagement. "The Neon Yellow toner will help our clients create more impactful, high quality, vibrant print," says Benoit Chatelard, Vice President, Production Printing, Ricoh Europe. "There is a market appetite for high quality personalised stand out print and this latest addition to our portfolio will open up a wide number of opportunities. Everyday print possibilities, ranging from business cards and invitations to brochures and catalogues, can now benefit from an inventive twist. The toner provides a new way of making short or personalised print runs even more effective." The Neon Yellow toner is retrofittable, which means existing clients can expand the capabilities of the Ricoh Pro C7100X presses they operate today. If you would like any more information on the Ricoh production presses or any other production presses in Insight Systems' portfolio, please don't hesitate to contact us and allow one of our Production Print Specialists to advise on the correct device(s) for you.